On Saturday, my friend Angela and I had brunch at Bottega Louie, this fantastic restaurant, gourmet market and patisserie in Downtown LA. I've never been, but I've seen so many pics from other pretty blogs that I had to go check it out. I'm so glad I did! It's now one of my favorite places and another good reason to head downtown. I loved the dress patterns too :) Haha, I want it too. Purple is a great royal color and I like it. Thank you for the birthday wishes!! 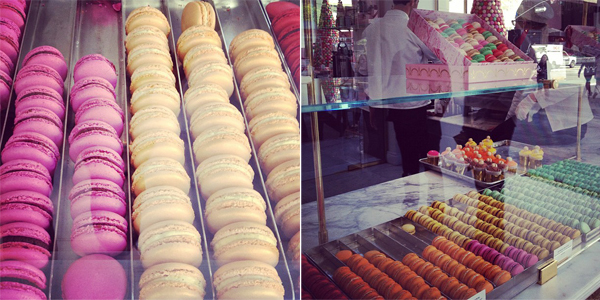 Their cakes and macarons look delicious, definitely a place to visit often.